I'm so sick of making food my kids don't eat. This morning, as I do every morning, I asked them what they wanted for breakfast. And after vetoing all the stuff that they know that can't have but suggest anyway ("Fruit snacks!" "Cupcakes!" "Ramen noodles! "), they requested oatmeal (or "meat-meal," as Coby pronounces it, which makes my stomach turn every time). Only they can't make it simple, you know, and all want the same flavor. There's one request for strawberry. One for peach. One for blueberry - two packets, he insists, because he's staaaarving - and please Mommy can you make it extra runny like Nana does? So I fill all the orders like a waitress, and I put the steaming bowls of goodness in front of them at the table, and then they eat one or two bites and then slide off their chairs and run around like madmen and decide that closing themselves into the bathroom and brushing their teeth with half the tube of toothpaste and getting it all over the mirror in the process sounds like a much better idea than eating their breakfast. So there it sits. Getting cold. ... Until Mr. Goldilocks himself, my cat Thurman, makes an out-of-nowhere appearance on the chair. And this is how it always starts out. 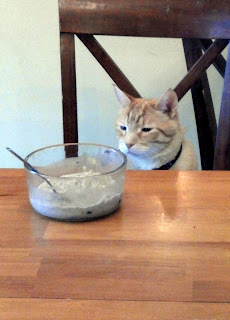 Notice how he looks all nonchalant, like, "Oatmeal? What oatmeal? I'm just sitting here trying to sleep, yo." "I am at this table for no other purpose than to take a nap. See how convincing I am?" "Why, what a surprise! There is a bowl of oatmeal in front of me!" "Nom nom nom ... oooooatmeeeeeal." And while I didn't take a picture, what happens next is just as inevitable. The barf. Because, you see, Thurman has always had a weak stomach and literally barfs up everything he eats that isn't his special "sensitive stomach formula" cat food. 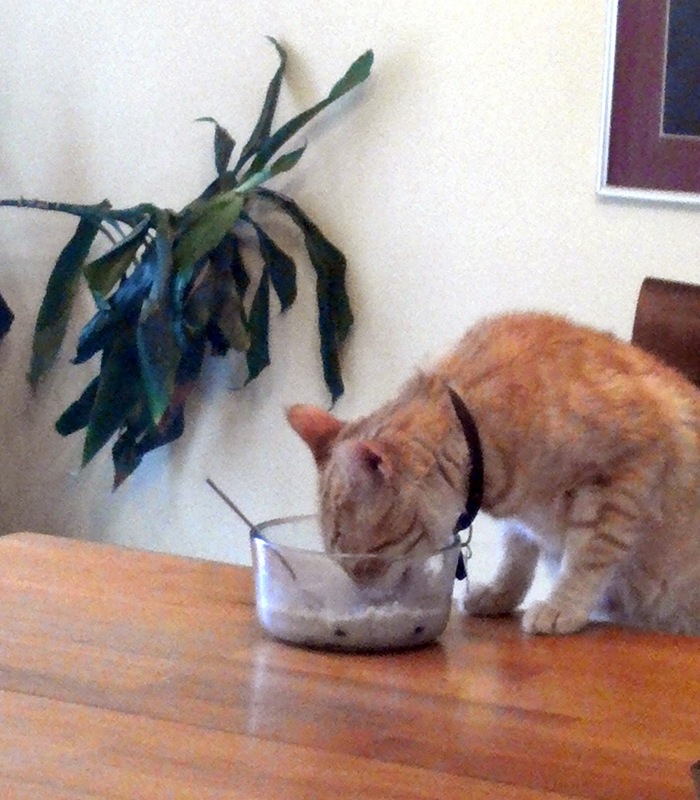 Yet he still insists on scavenging leftovers every chance he gets. Usually, that isn't very often, because due to my deep hatred of cleaning up bodily fluids I maintain a hyper-vigilance and shoo him away at the first inclination that he's creepin' on a bowl of something. Anyway, all this goes on until I finally get tired of chasing the cat away and decide to chalk it up to a loss and dump the bowls of oatmeal (or omelets, or cereal, or pancakes, or other uneaten goodies) and clear the table. And then at like ten o'clock, one or more of the boys will wander in to the table and be all, "Wah!! Where's my breakfast?" and I'll be like, "Dude. You didn't eat it. I threw it away." And then, after a disappointed pause, they'll say, "Oh. Well ... can I have fruit snacks, then?" I didn't know you had a cat too! Very cute! I love his name too! I'm also sorry to hear that he has a weak stomach. Poor Thurman! the girls do it to,and to top it off the girls wont eat the eggs we make for breakfest, they say did you make them just like pappaw? well yes!!!! they take one little little bite and say nope not like pappaw's!!! even thow you followed everything just like it said, so most of the time it goes to the cats. Oh how I can relate to this! I admit that I have become a short order cook. Why? Because it is easier than the food battle. I have two that love breakfast and will usually eat every bite and one that does exactly what your kids do. UNLESS I let him have dinner leftovers for breakfast, but who really wants to smell reheated onion meatloaf at 7:00 a.m.? This. Every morning. It drives me insane. First, I just want to say that I love your blog. It gives me a much needed laugh at the end of my day. And I think you are such a loving mother. But honey, you need to put your foot down on these boys! You decide what is for breakfast, not them. 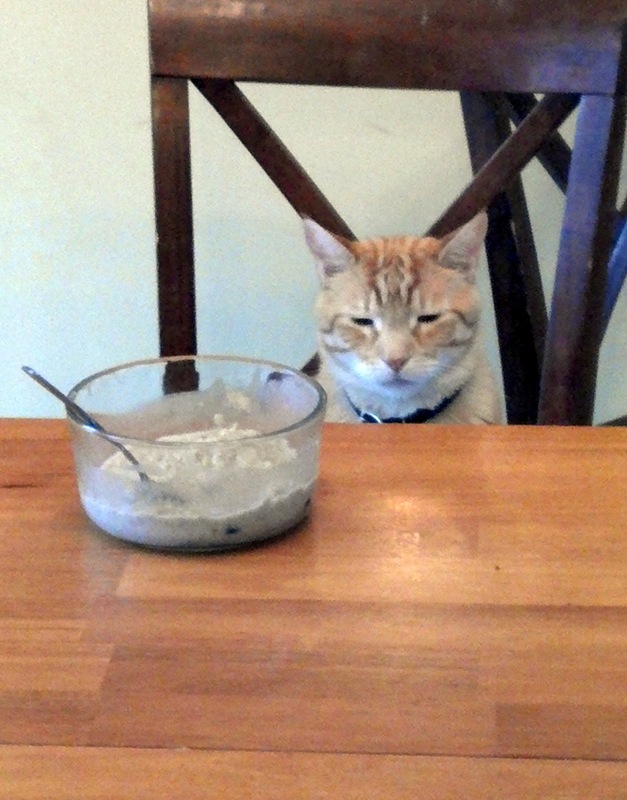 You make them sit and at least try the breakfast. And no one gets up until everyone is finished. Remember, you are the parent. You are in charge. If I had a dollar for every "I'm hungry" after a meal just finished, "where's my..." after I just threw the lonely plates out, or myself blabbering "this is not a restaurant" I could make up for all the money I waste on groceries. Rebecca hit the nail! It's take it or leave it at my house. When they pout and not eat...let them miss a meal, they won't starve and will be delighted with the next meal. You can do it! Your a great mom with lots of support behind you! Just a suggestion...keep the leftovers in the fridge and if they do want a snack warm it up (or if they r like my 5 year old eat it cold). I've thrown out so much good food and then caved when the battery of whines gets too much about being hungry before the next meal, I had to resort to this. If they don't want their breakfast/lunch/dinner leftovers for snack then they really can wait for the next meal. It saves us quite a bit of cashola. Same for school lunches, if they bring home a lunch box half full that becomes their afternoon snack (or they wait for dinner)...just a suggestion, beats throwing that money in the trash! !